Excellent preowned ladies Rolex Datejust (ref. 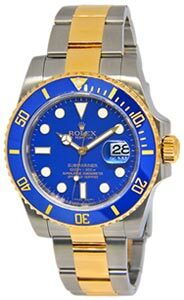 69178; s/n: W serial number~1995) in 18k yellow gold features an original blue Vignette diamond dial, fluted bezel and President bracelet with deployant buckle. Sized for a small wrist. We are a family owned brick and mortar Jewelry Store specializing in fine new and pre-owned jewelry and watches. Each of our pre-owned watches is fully checked and serviced. All items guaranteed authentic.